Lock in a great price for Hotel-Restaurant Stand'Inn – rated 8 by recent guests! It was clean, good value, with plenty of places to eat locally, with parking. The girl from reception was very kind and helpfull. The room and bathroom were clean. Easy acces to highway. Used as an over night stop en route to Germany. Clean room nice continental breakfast. Clean and renovated rooms (we stayed on 2nd floor). Easy access as located directly at the highway exit. Friendly and helpful staff. Good breakfast buffet. Good price/value. Lot of TV programmes (German, French others) on LCD TV. WIFI o.k. Powerful shower (no reducer as in other hotels). Super staff from reception to restaurant to housekeeping! Very friendly and very accommodating! Friendly staff, especially receptionist. Nice hotel without any luxury just practical, good value for money. Для меня в первую очередь было важно парковочное место для моего грузовика , написал письмо в отель с этим вопрос , быстро получил ответ . Рядом с отелем большая парковка где можно поставить грузовик или автобус , так же гипермаркет для меня это было идеальное месторасположение . Приветливый персонал , чистый номер в отеле тихо . Приятным бонусом был номер для курящих . Все понравилось с удовольствие вернусь в этот отель ! Hotel-Restaurant Stand'Inn This rating is a reflection of how the property compares to the industry standard when it comes to price, facilities and services available. It's based on a self-evaluation by the property. Use this rating to help choose your stay! 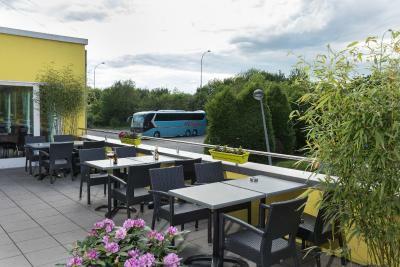 Located between Luxembourg City, the Belval, and Esch-sur-Alzette, Hotel-Restaurant Stand'Inn offers soundproof rooms with free Wi-Fi and a TV. Facilities include a 24-hour reception, a restaurant, and a bar. The air-conditioned rooms of Stand'Inn are simply furnished with a telephone, a work desk, a table with arm chairs, and an private bathroom. Guests can enjoy local and international dishes in Restaurant Le Pit Stop. Bar Le Warm Up offers a variety of drinks, including a large selection of wines. 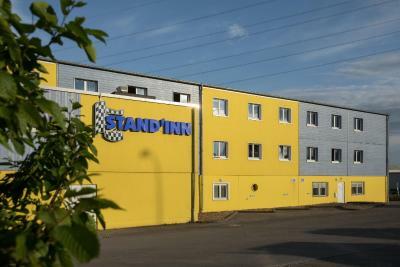 Stand'Inn Hotel-Restaurant is close to the major industrial sites of Dudelange, Pétange, Differdange and Schifflange. It is located next to Leudelange and the Cloche d'Or, Luxembourg City's southern commercial district. When would you like to stay at Hotel-Restaurant Stand'Inn? Special weekend rates on Friday, Saturday and Sunday night. This room includes a desk and a TV. House Rules Hotel-Restaurant Stand'Inn takes special requests – add in the next step! Hotel-Restaurant Stand&#39;Inn accepts these cards and reserves the right to temporarily hold an amount prior to arrival. Hotel-Restaurant Stand'Inn accepts these cards and reserves the right to temporarily hold an amount prior to arrival. Please note that the restaurant is closed on Saturday, Sunday and holidays. Please note that smoking rooms are available upon availability and on request. Please contact the hotel upon reservation or arrival to make arrangements. Please note that when booking without a credit card it is required to check-in before 5 pm. The air condition didn't work and het was hot in the room! The beds were rolling, i don’t know if the bed wheels have a break. Make some noise. Some bread for toast was not available. Crazy price for the quality offered. It is a low standards hotel, basic, needs some renewal. Too noisy (with closed windows, you hear the people outside in the commercial area and also the other guests from the other rooms) Bathroom with bad smell and with crazy system for shower! I took a shower and all the water flooded in the room, I asked help to the housekeeper and she said that she is used to dry the water on the floor because it happens often. This is not acceptable!